For decades, Beijing officials seemed bent on demolishing the city’s historical neighborhoods, erasing entire swaths of the single-story warrens of hutongs. Now, they say, they are trying to restore what remains. 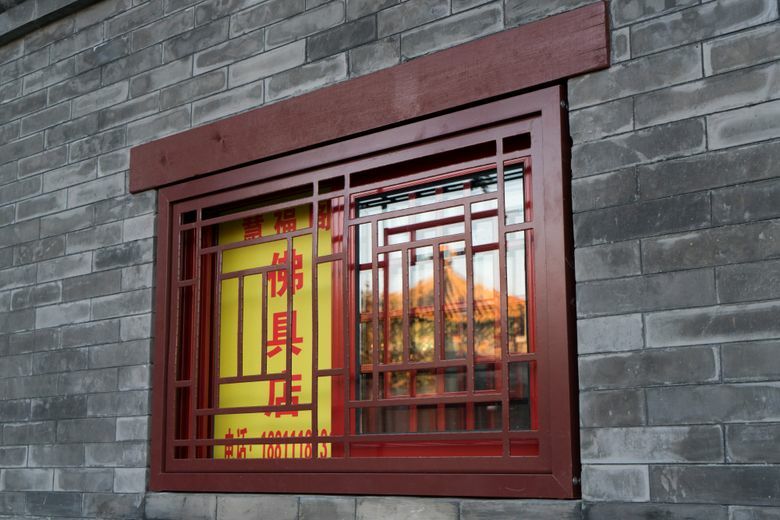 BEIJING — Beijing’s latest urban preservation campaign swung like a wrecking ball this summer through the colorful shops along Yonghegong Street, a tree-lined road between two of the city’s landmarks: the Confucius and Lama temples. Workers wielding crowbars, jackhammers and written orders from the city knocked out tiled eaves and wooden columns decorated with red lanterns and Tibetan prayer flags. Then they bricked up and painted over spaces that had once been doors or windows. Yuan Hong, who a decade ago opened a hair salon on one of the distinctive alleyways known as hutongs not far from Yonghegong, showed up there early one morning recently to find workers knocking out her glass storefront. They couldn’t, or wouldn’t. Even as she continued to cut, wash, dye and dry customers’ hair, workers stacked brick after brick where the entrance had been until she had been closed inside. By the end of the day, only a new window was left. When the first scaffolding came down on Yonghegong in October, the buildings had returned to something closer to their original design, more or less dating to the end of the 19th century. The cost, though, was the closure of at least a dozen shops that once sold incense, jewelry, paintings, sculptures and other religious paraphernalia to visitors who regularly throng the street. The goal is to “carefully polish every historical and cultural block,” Beijing Mayor Chen Jining put it in an address last spring. Preservationists, though, have greeted the work with ambivalence. 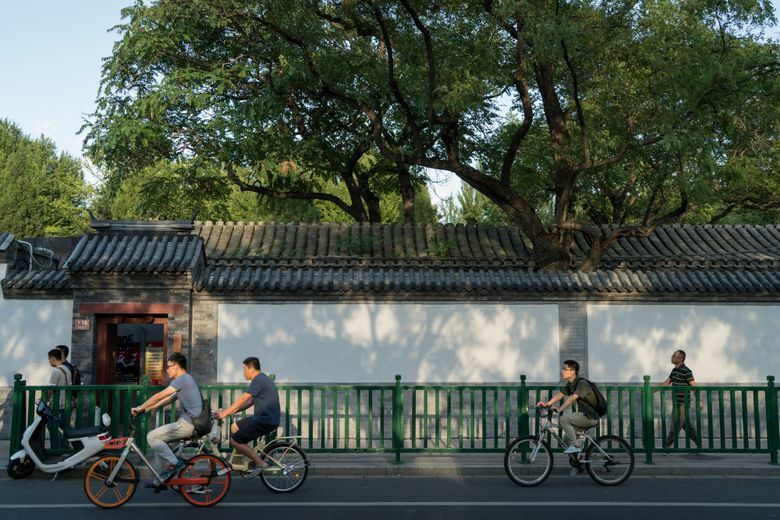 Many welcomed improvements to the old neighborhoods, noting that officials have also renovated public bathrooms, which remain primary sanitary facilities for many people because most old hutong homes still do not have indoor plumbing. Others say much of the new work is cosmetic. Instead of using bricks in many places, workers are instead affixing thin gray tiles to exterior walls. That might re-create the historical appearances of hutong homes and temples, but it does nothing to restore them. The restoration work around Yonghegong is part of a citywide “bricking up” campaign that is now in its second year. It has already shuttered scores of grocers, cafes, bars, barbershops and other businesses that mushroomed during China’s headlong plunge into capitalism. This being China, the restoration has been carried out by government decree — with minimal input from independent planners and preservationists and no public discussion of the merits. To live and work in the affected areas today is to experience a near-constant state of upheaval and uncertainty, as well the clouds of dust and piles of debris. Notices have appeared taped on buildings that, just days later, have been swarmed by workers. One supervisor on Yonghegong, ticking off buildings on what appeared to be a zoning map, said the work would move “step by step” through the city center. 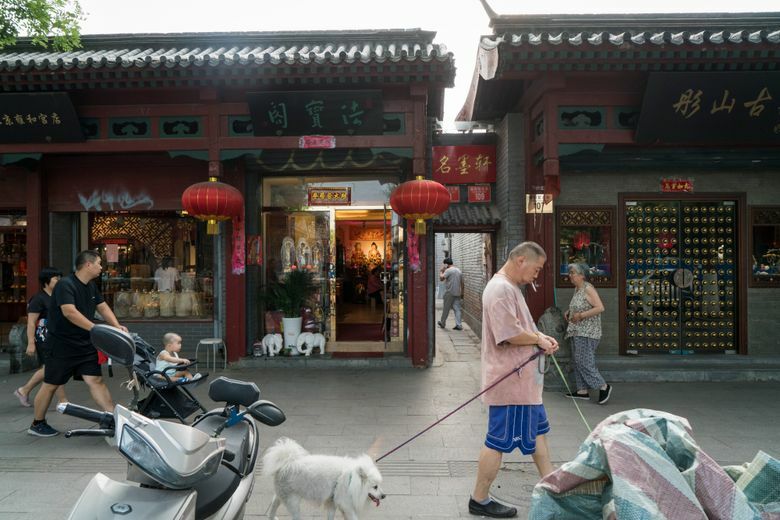 There have also been notices along other hutongs north of the Forbidden City, including two streets, Gulou and Jiaodaokou, which have a similar mixture of shops and restaurants and are also thronged with residents and tourists alike. “There is no room for negotiation,” said Yuan, the hairdresser. City officials did not respond to requests for comment. But workers have shown residents and shopkeepers written orders that made it clear officials want to clear the old hutong neighborhoods of unauthorized additions or extensions. That includes many of the doorways and entrances in the hutongs’ gray-brick walls, which traditionally enclosed inward-facing courtyards, as well as second stories in what are historically single-story structures. The basic contours of these neighborhoods date to the 13th century when the Mongol founders of the Yuan dynasty laid the city’s grid, and they are as distinctive a feature of the cityscape as the Forbidden City or the major temples. The mayor, in his fall 2017 address, singled out the neighborhoods inside the city’s Second Ring Road, which follows the path of the medieval city walls. Those walls stood for more than five centuries before being torn down in 1965 during another much-lamented urban renewal project in Mao’s time. Hu Xinyu, trustee of the Beijing Cultural Heritage Protection Center, said the city was bringing order to neighborhoods where economic forces and the lack of zoning enforcement had resulted in chaotic and even dangerous conditions. For shopkeepers like Yuan, her customers and residents nearby, the impact has been to unravel the fabric of city life. 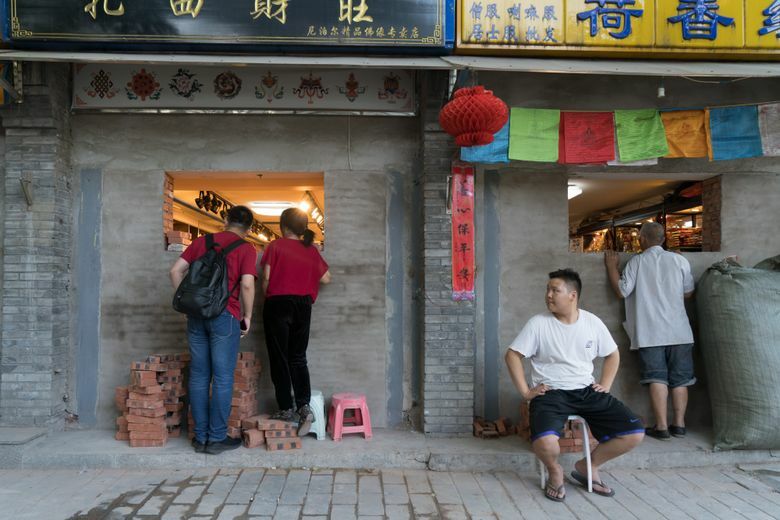 “This place is the real Beijing,” said Li Zonggao, 73, sitting on a chair outside his house not far from Yuan’s salon, and watching as workers built a new wall where three storefronts had until October been neighborhood fixtures. He expressed gratitude for the city’s attention, but also lamented the loss of the small shops, including the one where he bought his cigarettes. Along the hutong where he lives and Yuan works, several businesses have closed: a hardware shop, a congee and dumpling joint, the place that sold houseplants, the fruit and vegetable shop operated by the cheerful young woman, and the stall with the dour one who nonetheless made decent jianbing, a crepe-like breakfast staple. “How do people live a life?” Yuan asked. Rosie Levine, a scholar who has worked with the Beijing Cultural Heritage Protection Center and recently completed a thesis on the “bricking up” campaign, said culling small businesses was, in fact, the goal. “Commercialization has historically been seen in Chinese society as a polluting force,” she said. That too has had the effect of removing from the capital migrant workers from other parts of China, helping officials achieve their goal of capping Beijing’s population, which is nearing 22 million. Many of the city’s small shopkeepers are people who poured into the city during the transition to capitalism in hopes of making a living. Others attribute the work to President Xi Jinping, the first of the country’s Communist leaders to have grown up in a Beijing hutong. In 2014, he toured the neighborhood on one of his rare excursions in a public place, evoking nostalgia for the place that seemed deeply personal. Very few of the hutongs survive in anything close to their original state. 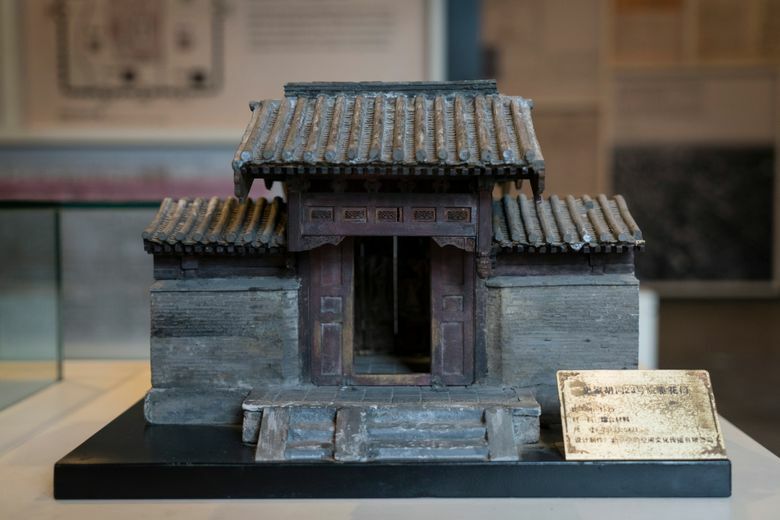 In 1949, there were an estimated 3,300 hutongs; today barely 1,000 remain, according to a survey Levine helped conduct for the Beijing cultural center. Many of those still remaining have been irrevocably altered — the courtyards inside divided and redivided during the seven decades of Communist rule.